HIV could lose its “special status” in Kenya’s health system if a new pilot programme integrating HIV care and public healthcare proves successful. Traditionally, public hospitals in Kenya have a “comprehensive care clinic” (CCC) dedicated to people living with HIV; under the new system, these would no longer exist. For more than six months, the Ministry of Health and its partners have been piloting the move in Western Province; senior government officials say it will not reduce the focus on HIV, but will ease pressure on an already overburdened and understaffed health system. “Integrating HIV treatment with other outpatient services doesn’t mean it has become less important; it only means maximizing on space and reducing the burden on healthcare personnel and to help increase focus on other equally important diseases like malaria,” said Ibrahim Mohamed, head of the National AIDS and Sexually transmitted infections Control Programme, NASCOP. 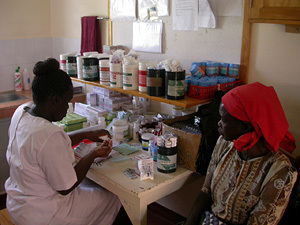 “It is not only reducing stigma but is also easing the staff shortages that had been experienced earlier when too much focus was placed on HIV/AIDS,” said Beatrice Misoga, HIV/AIDS integration officer for US government-supported AIDS, Population and Health Integrated Assistance II (APHIA II) in Western Kenya.